In October 1884 the American Federation of Organized Trades and Labor Unions declared that from 1 May 1886 the working day would constitute eight hours. Unions decided to strike on that day in support of the new measure and thousands took to the streets in major American cities. 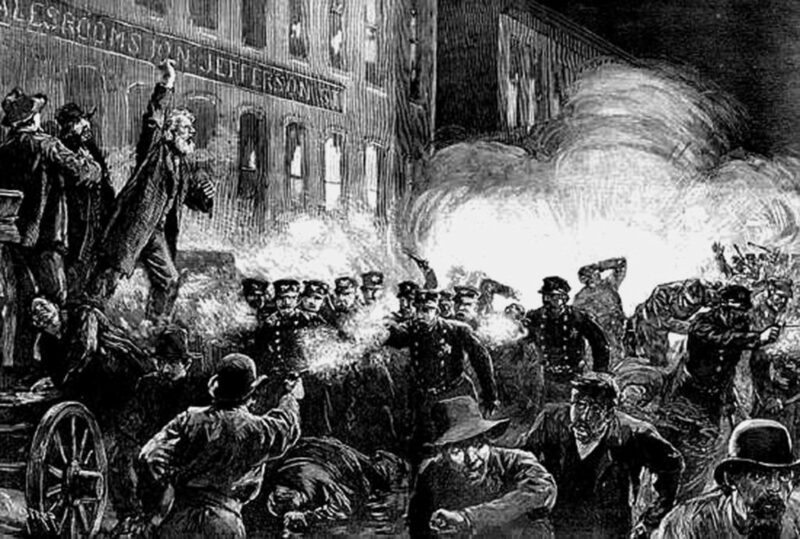 On 3 May six workers were shot and killed outside the McCormick Harvesting Machine Company plant at a meeting addressed by upholsterer and anarchist August Spies. Anarchists called for a rally the next day in protest with leaflets urging, “Workingmen Arm Yourselves and Appear in Full Force!” Spies refused to speak unless those words were removed and a new leaflet was issued. As a light rain fell on the evening of 4 May, the rally began. A large crowd listened to Spies while a group of policemen watched him. The last speaker finished at 10.30pm, at which time the police moved in to break up the rally. A pipe bomb was thrown and exploded, killing policeman Mathias J. Degan. The police began shooting and some workers returned fire. The incident was over in fewer than five minutes but eight police lay dead and 60 injured (most probably hit by their own comrades). An unknown number of protesters were also injured and probably four killed. Eight anarchists were arrested and went on trial. The trial began on 21 June and the prosecution claimed that whoever threw the bomb had been encouraged to do so by the defendants, even though no one suggested any of them had been responsible for the blast. Defence lawyer William Foster said, “If these men are to be tried… for advocating doctrines opposed to our ideas of propriety, there is no use for me to argue the case. Let the Sheriff go and erect a scaffold… and let us stop this farce now.” On 19 August 1886 the jury found August Spies, Michael Schwab, Samuel Fielden, Albert R. Parsons, Adolph Fischer, George Engel and Louis Lingg, guilty of murder. All of them were sentenced to death. Oscar W. Neebe was found guilty of murder and sentenced to 15 years in jail. On 10 November 1887, Louis Lingg committed suicide in his cell and the sentences of Fielden and Schwab were commuted to life in prison. The next day Spies, Parsons, Fischer and Engel were hanged. The site of the incident was designated as a Chicago Landmark on 25 March 1992.